This Distressed Wood beveled Mirror is one-of-a-kind beach mirror with wood framing the round frame. 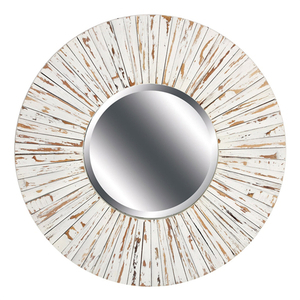 This circular wood mirror adds beauty to any room. Decorative tropical themed mirror with frame mounts on the wall. Great for a bedroom living room and more. Overall Measures: 30in H x30in W.